This Chelsea Home Long Sleeve Football Shirt 2018 2019. Complementing the blue and white, Chelsea’s 2018-2019 shirt includes a fair bit of red in the form of tapered stripes that run from the edges towards the center, both on the front and back. They alternate with similar white stripes to create a unique look unlike anything the club has ever worn – although in general it’s inspired by some of the classic Chelsea shirts from the 1980s and 90s. Cheer the blues as they head in to a new era with the Chelsea Home 2018-19 Home Long Sleeve Shirt launching the club in a fresh direction with a dramatic twist on the classic kit, incorporating red and white flashes across the rush blue design. A nod to the club’s signature look is featured on the inside, with printed “Blue Is The Colour” wording. SoccerLord provides this Cheap Chesea Home Long Sleeve Football Shirt also known as the Cheap Chelsea Home Long Sleeve Soccer Jersey with the option to customise your football kit with the name and number of your favourite player including Cesc Fabregas, Eden Hazard, Willian, an iconic player such as Didier Drogba, Gianfranco Zola or even your own name. 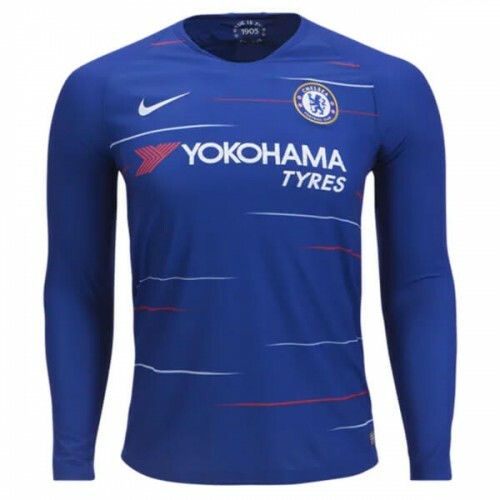 >Chelsea Home Long Sleeve Football Shirt 2018 2019.